From Vidalia With Love: The Balloon Festival with the Great Folks of Vidalia! I was recently retained by the City of Vidalia, Louisiana, to get some photographs of the 2015 Balloon festival activities along the city’s amazing riverfront. Typically, as with any genre, outdoor event photography has its own particular set of challenges that must be overcome. It usually is a tough combination of the physical strain of being on your feet for many long hours while constantly moving, coupled with compositional challenges such as getting quality, compelling shots without power lines, light poles, or other “ugly elements” in the photos. I must say however, that this past weekend was made into a fun and very pleasurable experience, and it was primarily due to the overwhelming friendliness and pride that the citizens of Vidalia displayed to me. Their warmth and enthusiasm made the difficulties of the work seem so much less bothersome. The community of Vidalia prides itself on being a family-oriented community and it clearly shows! I can testify first-hand that this was very much in evidence throughout the entire weekend. There were families and children all over the place, plenty of smiles, and a lot of excited chatter about almost everything: from opinions on whether the balloons would be able to fly … if the windy conditions would ever calm down … on how good the food was … to predictions on the LSU – Florida game! In the midst of all of that, I noticed a couple of the children taking advantage of the water sprinklers despite the cool temperatures. I was able to corral one of them for a nice shot. Alas, those dastardly winds didn’t ever subside, and the featured hot-air balloons were not able to fly. However, that didn’t deter the spirits of the many people I met and spoke with! While most were hometown citizens of Vidalia, many were from far away locations. As just one example, I spoke at length with a very pleasant married couple who hailed from Wichita, Kansas. The woman told me that this was her first trip to Vidalia, and both stated that they absolutely loved the area and were very much looking forward to the remainder of their stay. They were lined up along the rail to watch the fireworks display. On assignments such as this where you engage directly with the public, and you have a couple of high-end cameras with big lenses around your neck, people can have various reactions to you coming up to them. Some of them can be quite humorous, especially with the children. 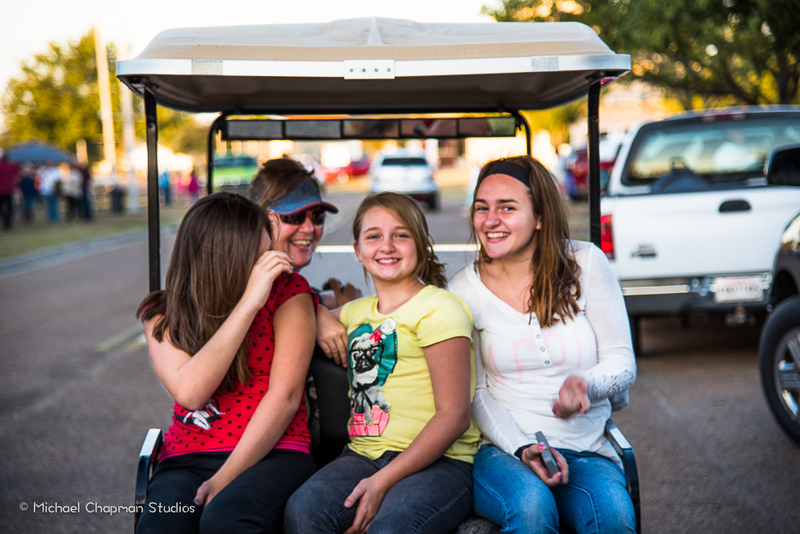 In this photo, most of this golf cart’s occupants were all too happy to smile and wave, and really got excited that their photo was being taken … all but one very camera shy young lady! Look at those smiling faces, you gotta love it! I often receive eager queries as well, such as, “Are you shooting for the newspaper? … CNN?” … “Will my photo be on T.V.?!! 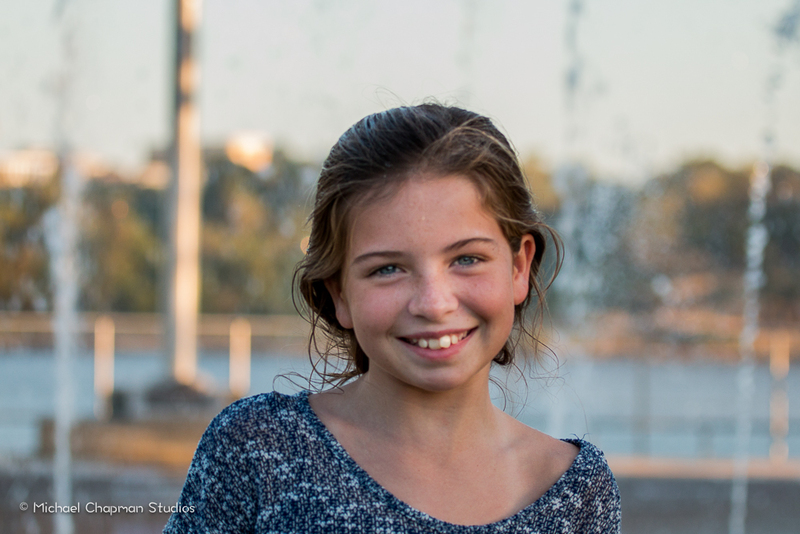 !” When I told them I was shooting for their City – Vidalia – they beamed with pride and said, “Wow! That’s very cool!” They really were impressed that the City’s marketing director Sheri Rabb is constantly looking for innovative ways to display their City in a quality manner. I’m not just saying that either. I was genuinely struck by how person after person I talked to, when they discovered I was shooting for them, really came across in a manner that told me that they are very unified in their efforts to be a city they can all be proud to live in. They often mentioned Sheri by name, as well as the mayor, and other City employees. In a small town, everyone knows everyone else. I was impressed at how they all were on the same page and all truly interested in the image of their community. They have a lot of pride, and it shows in their efforts, their out-going, friendly nature, and the results that the City is achieving. There were lots of fun activities, including the face-painting shown here. One of the best single moments of the entire weekend was the fireworks display. I’ll be honest, I’d never experienced or photographed it from the Vidalia side of the River (I know, I know – shame on me!). I’ve always shot it from the Mississippi side, and from all the obligatory angles: from (of course) the old Ramada hilltop; from the Bluff near the gazebo; from the bottom of Roth’s Hill Road; and even from the waterline at Bailey Park with the water soaking my feet. The view from the Vidalia riverwalk is truly stunning, and I think it tops them all. The crowd along the riverwalk was enthusiastic, and asked me all kinds of questions, “Now what is your name?” “Are you from here?” “Do you know so and so…?” It was a lot of fun, and we all had a great time. So, hat’s off to Vidalia! Again, a big thank you to all of the kind folks who endured me sticking my camera in your face and taking your shots! I enjoyed your hospitality, your gifts of water or a bit to eat, your friendly waves, and your smiles … and I hope to see much more of you in the future. Until then, I’ll close out this post with one of my results of the fireworks display: From Vidalia With Love!